Union officials are meeting executives from pizza chain Domino's Pizza to try to resolve a dispute over the sacking of eight migrant Hungarian workers. T&G Unite says the workers at a Derby franchise of the chain are the victims of what it calls "modern-day slavery". The meeting follows a confrontation between the two sides on BBC Two's Newsnight on Friday. 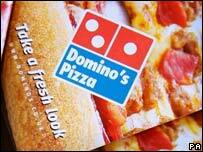 The Domino's franchisee at the heart of the affair said the charges were without foundation. According to T&G Unite regional officer Simon Wallace, the workers are also facing eviction from the terraced house they occupy in Derby. The arrangements they made with their employer mean they are obliged to vacate it if they lose their jobs. T&G Unite alleges that the Domino's franchise in question, owned by Surinder Kandola, unlawfully deducted money from the workers' pay packets, leaving them with "minus wages" - in effect, owing their employer money. Steven Hemsley, chief executive of the franchisor Domino's Pizza, told the BBC he was determined to get to the bottom of the deductions. "We're the sort of company that does look after its workforce, and we expect them to be treated fairly and honourably, and we expect our franchisees to deal with them honourably," he said. "I can't fully explain what's happened yet, but I assure you I will do." The company claims the workers were sacked because they had refused to comply with Home Office requirements to register. Mr Kandola assured the BBC he had not exploited anyone and the charges were "without foundation". Instead, he said, he was the victim of a "vindictive" campaign of union bullying.